Urbana’s Gloria Theatre has a rich history that began more than 113 years ago near the beginning of the twentieth century. In 1904, The Clifford Theatre was constructed by famous vaudeville actor and Urbana native William Shyrigh, born in 1869 to Urbana residents, Levi and Sarah Shyrigh. William was better known by his stage name, Billy Single Clifford, hence the name “The Clifford Theatre”. It was a spectacle of its time with an 80-foot stage and a seating capacity for 700 patrons. The cost was $75,000 which equates to about $2 million today. 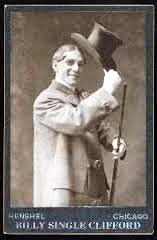 Billy Clifford starred with popular vaudeville troupes in the finest theatres of New York, Baltimore, Richmond, Norfolk and several cities in Europe. He often shared the stage with some of vaudeville’s most famous performers, like Buster Keaton, and frequently the marquees would list Billy Clifford as the show’s headliner. One of Billy’s many successful productions, “The Diamond from the Sky,” was a serial show that played in Urbana for several months, drawing sellout crowds at the ticket price of 10¢ a couple. A mass meeting was held at the Clifford to recruit young men to fight in World War I. The Clifford was often the site of public gatherings for various community issues and events. The third floor was destroyed by a fire that was the last in a series of fires at the Clifford in 1918 and 1919, suspected to be caused by sabotage. The losses included a large portion of the theatre and most of Billy Clifford’s fortune. Billy could not afford the necessary repairs so most of the Clifford Theatre sat dormant. Unusable for large theatrical productions, it began to deteriorate. In 1930, Billy Single Clifford took his final curtain call at the age of 61. After the repeal of prohibition, a liquor store opened in what had been the post office room in the Clifford. Warren Grimes, founder of Urbana-based Grimes Manufacturing and known for his philanthropic endeavors, purchased the decaying theatre and invested in an extensive remodeling and repurposing project at a cost of, again, about $2 million in today’s dollars. The theatre reopened on Christmas Day, 1941 as “The Gloria”, named after his youngest daughter. This was a tremendous boost for the community, bringing Hollywood’s top movies to town and providing a beautiful new venue for various community events and showcasing local talent. During World War II, thousands of residents appreciated the frequent “NewsReels” reporting recent victories and troupe movements in the war. For 26 years, The Gloria was the entertainment gem of the community. Thousands of Champaign County residents still fondly remember Gloria’s golden years. The theatre was sold to Chakeres Theatres and later converted to two screens and renamed the Urbana Twin Cinemas. For the next 25 years, Chakeres operated the twin cinemas offering first-run movies but, when large cineplexes opened in nearby cities, Chackeres opted to go with sub-run or second run movies and discount tickets as a move to increase attendance. As technology evolved, it became harder for smaller theater chains to stay open due to the high costs of upgrading to digital projection. Chakeres closed the Twin Cinemas in 2013 and put the building up for sale. The Urbana United Methodist Church (UUMC) purchased the building in 2014 and formed the community-based nonprofit GrandWorks Foundationto operate the theatre and guide the effort to transform it into a platform for social, spiritual, cultural, and economic growth.UUMC decided to “gift the theatre to the community via GrandWorks” upon paying off the mortgage. The theatre was renamed “the Gloria” to give Glory to God, to honor the Grimes legacy and make the theatre, once again, a wonderfully valuable gift to our community. 113 YEARS AGO, BILLY CLIFFORD SHARED A VISION. 76 YEARS AGO, WARREN GRIMES SHARED A VISION.